This is a set of photocopies that we get from the Stanley Museum. 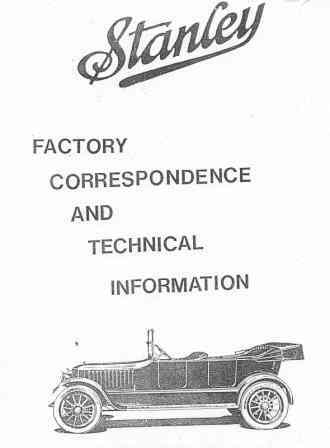 They include copies of original factory correspondence, technical material and factory statements regarding their operation, repair and maintenance of their vehicles, as well as shipping summaries and pricing information. Information on the maintenance and repair for the pilot, smoking burner, setting valves, lack of power, etc. will be of interest to the steam enthusiast. We have a few of these in stock at the moment, and more can be ordered in, but supply is often slow.